This time of the year is full of celebrations, which calls for special food to share with family and friends. But, this time of the year also is full of hustle and bustle. What is a gluten-free cook to do? Make a delicious strata, of course! A strata is made from similar ingredients as French toast but layered to create a beautiful presentation on the holiday table or for that special brunch. We even like this for a fun “Breakfast for Dinner” night on a snowy evening. 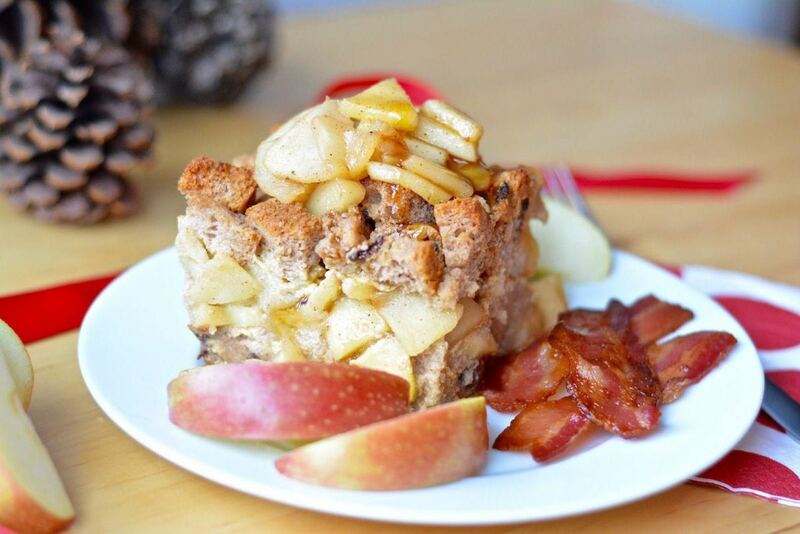 The flavor is somewhere between French toast and bread pudding, taken over the top with Three Bakers perfectly cinnamon-infused gluten free raisin bread and sautéed apples. And the easy part? Simply put the strata together the night before you need it. Cover and tuck into the fridge and your meal is ready to bake up when you are. Couldn’t get easier than that. Enjoy! Make apple filling: Heat oil in a skillet. Add apples and cook until crisp-tender. Add sugar and first measure of cinnamon and nutmeg. Continue to cook until juices thicken. Remove from heat. Set aside one cup of apple filling, if desired for serving. Oil a 10 1/2”x7 1/2” or 9”x13” pan. Put half of the Three Bakers Cinnamon Raisin Bread cubes into pan. Layer apple filling evenly over bread cubes. Top with remaining bread cubes. Blend eggs, milk, cream, maple syrup, vanilla, cinnamon, nutmeg, and salt until smooth and well incorporated. Carefully pour egg mixture over bread cubes. Cover pan with plastic wrap and place in the refrigerator overnight. When ready to bake, preheat oven to 350 degrees F. Take plastic wrap off pan, cover with foil and bake strata for 40 minutes. Remove foil and bake 15 more minutes, until golden and egg is set.